On Thanksgiving Vicki and I spent the day alone. All the kids and grandkids could not be here. I think this is when I’m supposed to have a sad face. Yet we knew that they were all busy being with other family members. I assure you that Vicki knew exactly what could keep us busy that day. We put up Christmas decorations – inside and out! Of course Vicki took care of the inside and appointed me to put up the outside lights. Since that has been my job in years past, I knew how to set the lights out so it was just a matter of putting them up on the house. The truth is that it all went really smooth. I got the ones on the house up and even put some on the bush. I hooked them up to the power and flipped on the switch. They worked – at least three of the four on the house and one of the two on the bush. Since I didn’t have any others for the bush I just slipped them off and focused on the house. I replaced the one on the house trying to be careful that I didn’t break any or mess them up so they didn’t work. I even asked Vicki to come out and hold the strand so that they didn’t hit the ladder or the concrete. After carefully putting them up, Vicki flipped the switch and everything worked! It was one of those moments when you just smile knowing that you have crossed another mark getting you closer to the finish line. I knew that there was more to do, but that obstacle was over. As I was working on the lights trying to determine what would be my next step, I realized that the lights I was putting up had to be fully operating and connected in order for everything to work properly. There was probably just one bulb in the strand that wasn’t working and transmitting the power through the rest. Realizing this made me stop and think. That strand of lights is a lot like us as Christians. If one is not working in the way it should, the rest won’t work as they need to work. One impacts the other and the whole strand is affected. I didn’t hang the lights outside just so people could see the lights in the daytime. I put them there to be seen at night. In order to get the lights working I had to replace one strand. Then the lights came on and are doing what they were intended to do. It was not a matter of replacing them all, just the ones not working. 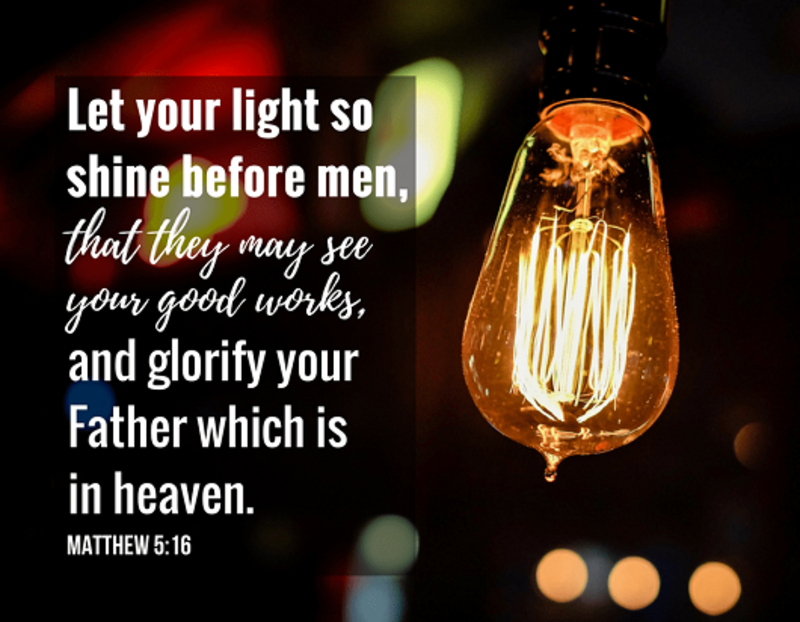 For Christians it is important that our ‘light’ be seen by all those around us so that they will see that light and ‘glorify our Father who is in heaven.’ It is important that we be ‘connected’ to the Father so that we will have the power we need in our lives. This Christmas season -- and all through the year -- remember that you are the light that will shine so that others will see your good works and glorify God. 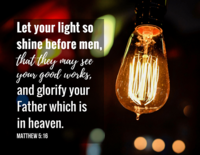 So – Let your light shine! JESUS, JESUS, JESUS, ist etwas über diesen Namen! !